This antibody detects a band at close to 34kDa in all species tested. The band can be completely blocked with the immuising peptide in all cases - this is very strong evidence that the antibody is recognising fibrillarin. Synthetic peptide corresponding to Human Fibrillarin aa 1-100 (C terminal) conjugated to keyhole limpet haemocyanin. This antibody gave a positive signal in the following whole cell lysates: HeLa; A431; Jurkat; 293T. 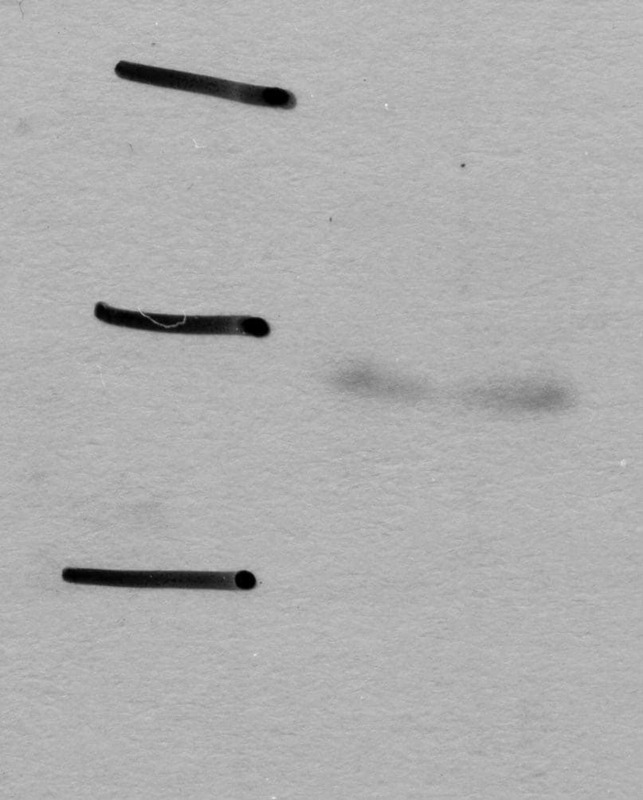 This antibody also gave a positive signal in HeLa nuclear lysate. ICC-IF: Hela cells. Our Abpromise guarantee covers the use of ab5821 in the following tested applications. WB Use a concentration of 1 µg/ml. Detects a band of approximately 39 kDa (predicted molecular weight: 34 kDa). Additional bands at: 42 kDa, 70 kDa. We are unsure as to the identity of these extra bands. ab5821 stained in Hela cells. Cells were fixed with 100% methanol (5 min) at room temperature and incubated with PBS containing 10% goat serum, 0.3 M glycine, 1% BSA and 0.1% triton for 1h at room temperature to permeabilise the cells and block non-specific protein-protein interactions. 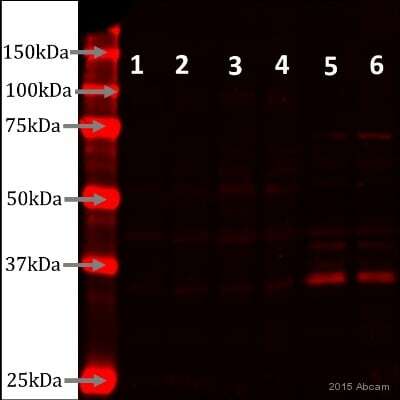 The cells were then incubated with the antibody ab5821 at 0.1 µg/ml and ab7291 (Mouse monoclonal [DM1A] to alpha Tubulin - Loading Control) at 1/1000 dilution overnight at +4°C. The secondary antibodies were ab150120 (pseudo-colored red) and ab150081 (colored green) used at 1 µg/ml for 1 hour at room temperature. DAPI was used to stain the cell nuclei (colored blue) at a concentration of 1.43 µM for 1hour at room temperature. incubated in 1%BSA / 10% normal goat serum / 0.3M glycine in 0.1% PBS-Tween for 1h to permeabilise the cells and block non-specific protein-protein interactions. The cells were then incubated with the antibody (ab37266, 1µg/ml, red) and (ab5821, 1µg/ml, blue) overnight at +4°C. 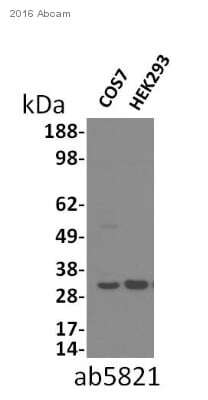 The secondary antibodies were ab150115 Alexa Fluor® 647 goat anti-mouse IgG (H+L) used at 2µg/ml for 1h and ab175652 Alexa Fluor® 405 goat anti-rabbit IgG (H+L) used at 2µg/ml for 1h. 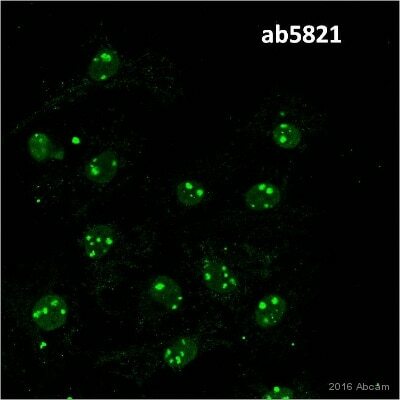 Immunofluorescent imaging of human cells (U2OS) with ab5821 reveals highly specific localisation to the dense fibrillar component (DFC) of the nucleolus associated with the initial ribosomal RNA (rRNA) precursor. The nucleolar protein fibrillarin is located primarily in the DFC. Blue is hoechst staining of the nucleus, green is ab5821 used at 1/100, merge image demonstrates exclusively nuclear localisation. IF was performed with a standard paraformaldehyde technique (fixed in PBS buffered PFH 4% for 5 minutes, permeabilised with 0.5% triton-PBS for 5 minutes, blocked with 5% milk / 0.2% tween for one hour. Primary antibody used at 1/100 in 5% milk / 0.2% TWEEN for one hour, secondary antibody Alexa 488 for 30 minutes. All blocking and incubation steps carried out at 37 degrees C.
ab5821 staining human liver tissue sections by IHC-P. Sections were formaldehyde fixed, permeabilized in Triton-X and subjected to heat mediated antigen retrieval prior to blocking with 6% BSA for 2 hours at 23°C. The primary antibody was diluted 1/100 and incubated with the sample for 16 hours at 5°C. 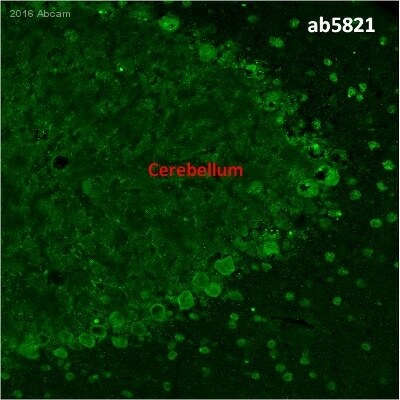 ab6717 was used as the secondary antibody. 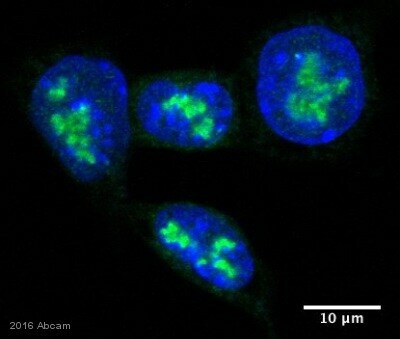 IHC - Wholemount - Anti-Fibrillarin antibody - Nucleolar Marker (ab5821)Image from Larson K et al., PLoS Genet. 2012 Jan;8(1):e1002473. Epub 2012 Jan 26. Fig 3.; doi:10.1371/journal.pgen.1002473; January 26, 2012, PLoS Genet 8(1): e1002473. Immunohistochemical analysis of salivary glands from Drosophila melanogaster larvae, staining Fibrillarin with ab5821. Tissues were fixed in 4% paraformaldehyde/PBS and 0.3% Triton-X/PBS before incubation with primary antibody. Publishing research using ab5821? Please let us know so that we can cite the reference in this datasheet.